The rapid growth in market share of Long-Term Service Agreements (LTSA) has caused a paradigm shift in the business aircraft aftermarket. As such, aircraft owners no longer need to take on the risk of managing maintenance on a time and materials basis. Instead, Original Equipment Manufacturers (OEMs), namely, designers and manufacturers of aircraft and engines, now proactively offer and share the benefits of LTSAs with aircraft owners. LTSAs therefore enable the aircraft owner to experience an outstanding level of service at a fixed price, which is far less expensive than the traditional time and material business model that had the aircraft owner assume all maintenance risk and volatility of cash flow. This transition coincides with the growing popularity of the business aircraft market: “Business jets allow busy people to get more out of their day – meet more people, accomplish more business, and resolve the balance between life at work and at home”, said Stephen M Friedrich, Vice President of Marketing and Sales for Civil Small & Medium Engines at Rolls-Royce. “That is achieved by getting more out of their aircraft, such as flights tailored to individual schedules, with the flexibility to change timings as circumstances or locations change”. Large cabin customers, for aircraft including Legacy650, Cl605, Falcon 2000, 900, 7X, Globals, G450/G550/G650, are increasingly demanding as they require the best performing aircraft in terms of range, speed and comfort. “They also demand exceedingly high levels of reliability and service in order to meet schedule requirements. To maximise the availability of a business jet, and retain its residual value and sales liquidity, an aircraft needs service support – and that is where Rolls-Royce can be trusted to deliver excellence”, Friedrich told World Finance. Large Cabin customers are always searching for faster, larger, more luxurious ways to travel and with the ability to travel even further than before with less down time. To this end, Rolls-Royce is working closely with airframe partners to address these desires and provide market-leading products and levels of service that can accommodate them. Rolls-Royce has maintained its position as the market leader in business aviation engines through its trademarked CorporateCare – the industry’s most comprehensive and cost effective engine maintenance programme. As well as offering flexibility, being available for both new and in-service BR725, BR710, Tay and AE 3007 engines, it also provides operators with significant financial benefits, including predictable maintenance costs, reduced capital investment and, perhaps most importantly, increased aircraft residual value. “We are continually evolving and enhancing CorporateCare”, explained Friedrich. “Recent additions to the coverage include labour for line replaceable units and borescope inspections required under the air-framer maintenance manual.” Not only do these enhancements entail a more comprehensive service for the customer, they also provide Rolls-Royce with a greater volume of service engine data, which in turn further supports what the industry refers to as ‘Engine Health Monitoring’ and enhances the company’s ability to forecast costs. “We have a dedicated operational service desk that is open 24/7, which has drastically improved our responsiveness and operational availability. We already see the benefit of this service as we have significantly improved averted missed trips to over 97 percent, while our average AOG response resolution time is now under 24 hours”, Friedrich added. Along this vein, Rolls-Royce is also making a strong push to develop its network of Parts Distribution Centres in order to exceed customer expectations and improve the time needed to ship. Being the only programme for Rolls-Royce powered aircraft that fully transfers the risk of engine maintenance from the owner to the OEM – which also entails immediate tax benefits – CorporateCare continues to experience impressive growth. Almost 1,900 aircraft around the world are now covered by CorporateCare and more than 70 percent of new delivery Rolls-Royce powered aircraft are enrolled in the programme. “Rolls-Royce is committed to delivering global support and ensuring that business jet travellers continue to benefit from the comfort, speed, privacy, flexibility and reliability that a time machine brings”, Friedrich commented. This popularity is also explained by the fact that Rolls-Royce was responsible for creating the concept of services on a fixed-cost-per-flying-hour basis in the first place. As such, the heritage of CorporateCare stretches back to 1962, when Rolls-Royce transformed business aviation with the launch of its trademark service Power-by-the-Hour (PbtH), in order to support the Viper engine powering the de Havilland/Hawker Siddeley 125 business jet. “PbtH pioneered an approach to engine management that aligned the interests of the engine OEM fully with those of the aircraft operator. The engine manufacturer therefore became rewarded only for engines that performed”, Friedrich explained to World Finance. Additionally, what made PbtH so unique was that it offered a complete engine and accessory replacement service on a fixed-cost-per-flying-hour basis, which enabled the operator to forecast costs with great accuracy, thereby enabling the mitigation of maintenance cost risk and avoiding the necessity of investing in stockpiles of engines and accessories. With over 50 years of experience in serving the market, Rolls-Royce knows its customers well. What’s more, being number one in the market to power wide body commercial airliners enables the company to utilise leading edge propulsion technology in its business jet products. “We have a deep understanding of business jet customers, and so we recognise the importance of providing high performing engines that are supported through an industry-leading support network”, said Friedrich. With this in mind, Rolls-Royce recently implemented an overhaul of its technical publications in order to provide clear, comprehensive and up-to-date guidance for its customers. And taking that one step further, the entry of the BR725 engine into the service came with the introduction of 3D technical publications. This technology is now being rolled out to other engines also, including the highly popular BR710. In 2012 Rolls-Royce introduced its automatic Engine Health Monitoring data downloads for the G650 aircraft, and has recently extended this well-received service to the G450 and G550. As such, there is an ongoing focus for the company to reduce the need for manual downloads, while also improving its overall data acquisition from in-service aircraft. 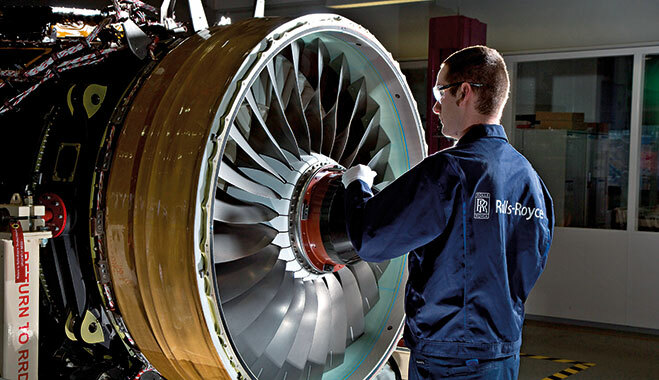 “Having real time data available further enhances our ability to monitor the performance and behaviours of our engines, which will improve our ability to react proactively and quickly to any issue that may arise.” This applies also to CorporateCare, where the network of Authorised Service Centres that are approved by Rolls-Royce continues to grow in order to ensure that customers are never far from the right people that have the right tooling and parts, wherever they fly. Naturally, there is a mobile app to add further convenience to the service – MyAeroengine Support provides essential maintenance information to aircraft owners and operators on the go. From an iPad, iPhone or Android device, customers can immediately email or call any Rolls-Royce support location from within the application, or save contact information to the device’s address book. The app also offers detailed directions to any support office using the device’s GPS and map functionality. With technology and customer care at the forefront of the business model at Rolls-Royce, this historic company continues to set new precedents and trends, thereby consistently taking the market into unchartered, but much-welcomed, territory.